The great Connecticut River glides through western Massachusetts from north to south. The "Great Tidal River" was a highway to the interior for English pioneers in the 1630s, giving this region its name. West of Worcester and Quabbin Reservoir, east of the Berkshire Hills, Massachusetts' Pioneer Valley is marked by Greenfield to the north and Springfield to the south, connected by the valley thoroughfare of Interstate 91 (map). The alluvial riverbed soil is rich, and English settlers were farming at Springfield as early as 1636. The river provided easy transport to markets in New York and Philadelphia. Centered on Hampshire County, this "Five College area" is an educational center boasting four colleges—Amherst, Hampshire, Mount Holyoke, Smith—and the University of Massachusetts. 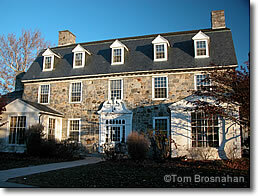 A Georgian-style stone house, now a library, in Amherst MA.